13 October 2017, Phnom Penh: Wing (Cambodia) Limited Specialised Bank and Sathapana Bank signed a Memorandum of Understanding (MOU) on Friday to offer payment collection service for SATHAPANA’s customers. The MOU is signed by Mr. Kato Norihiko, Sathapana Bank CEO and Mr. Jojo Malolos, Wing (Cambodia) Specialized Bank CEO. 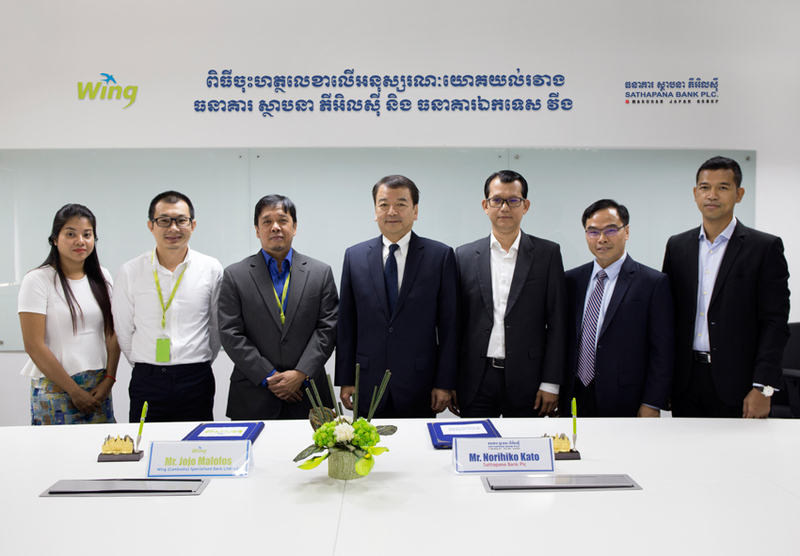 This partnership will provide both Sathapana and WING’s customers with convenient and seamless money transfer between Sathapana’s bank accounts and WING’s accounts and wallets across Cambodia digitally. It will also enables Sathapana’s customers to make loan repayment digitally through Wing accounts or through Wing’s 5,000 Cash Xpress Agents nationwide. Sathapana customers can make loan repayment through Wing account via USSD code or WingMoney Mobile App with the comfort of being at home at any convenient time. In addition, Sathapana’s customer shall also have an access to other Wing services such as phone top-up, utility bill payment, money transfer and a lot more. Wing, Cambodia’s leading mobile banking services provider, offers mobile money payment services such as money transfer, bills payment, phone top up, payroll service, online payment and pay with Wing as well as international remittance services. For more information, please visit us at www.wingmoney.com or 023 999 989/012 999 489. Sathapana Bank Plc. is one of the leading commercial banks in Cambodia with total assets of over USD1billion as of 30 September 2017 (unaudited). The bank provides full banking services; loans, deposits, domestic and foreign remittances, guarantees, export and import settlement, etc. throughout the country with 168 branches, 100 ATMs and more than 4,000 employees.